Catalonia's ex-leader Carles Puigdemont has been detained by German police acting on a European arrest warrant. 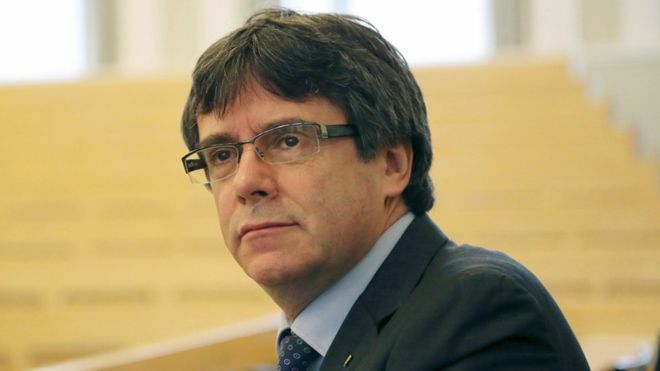 Puigdemont, who is wanted in Spain for sedition and rebellion, was held crossing from Denmark on the way to Belgium, his lawyer said, reports BBC. Puigdemont had been on a visit to Finland since Thursday. He has been living in self-imposed exile in Belgium since Catalonia's parliament unilaterally declared independence from Spain in October. The charges of rebellion and sedition that Puigdemont faces in Spain could result in 30 years in prison. He slipped out of Finland on Friday before authorities could arrest him. "The president was going to Belgium to put himself, as always, at the disposal of Belgian justice," his spokesman, Joan Maria Pique, told Reuters news agency. German police said that Puigdemont was detained by a highway patrol in the northern state of Schleswig-Holstein, which borders Denmark. Tensions in Catalonia are very high and its separatist leaders abandoned plans to name a new president following the arrest of the latest candidate, Jordi Turull, on Friday. Crowds of protesters had clashed with police in Barcelona on Friday night after Spain's Supreme Court ruled 25 Catalan leaders should be tried for rebellion, embezzlement or disobeying the state. Turull was among five people taken into custody in fresh arrests. What happened at North Korea's embassy in Spain?